We are very pleased with Samsian very professional excellent workmanship, trustworthy and reliable. Anyone thinking of having central heating overhauled or boiler fitted. Should definitely consider using Samsian you won’t be disappointed. We couldn’t have chosen a nicer company. 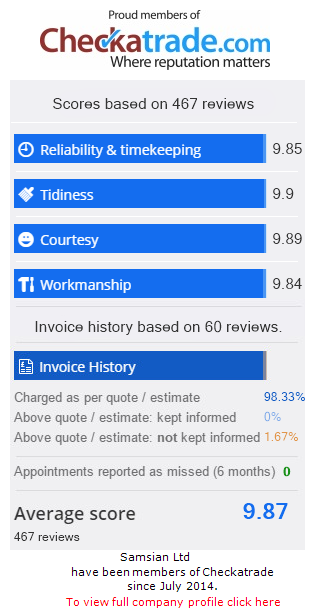 Very good, friendly and extremely efficient. Dan and his son Sam did an excellent job. All floors were covered with dust sheets and they left everything clean and tidy. Dan showed me how to work everything and set up the heating timer which was very helpful. Client Feedback FormClient feedback is vital in our business, which is why we like customers telling us, and others, of their experience with Samsian. Please complete the information below in order to submit your testimonial.